The Chamber offers many added benefits for your membership investment including ways to promote your business events, employment news, articles on best business practices, and enhancements to your business listing in our directory. One of the most cost effective ways to generate revenue for your business is to have other business professionals refer your business. Our three free Referral Groups are category-exclusive and are for members only. The online directory contains business listings for all of our members with a link to their websites, and a map to their business. Visitors to our site are able to search for businesses quickly and easily. Enhance your listing to include your logo, social media and more. Find or post listings for employment opportunities, whether you have job openings or are seeking employment. NAACCC members can share ideas, exchange important information, or further their posts on social media that start conversations to help businesses stay up to date in the market place and develop new tools to grow. Add trust to your brand & save with the Better Business Bureau. 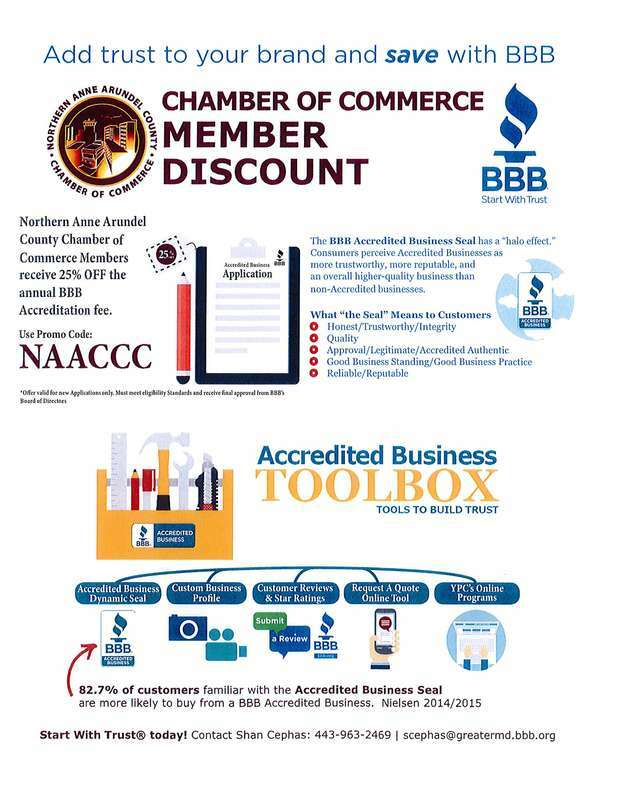 NAACCC is the only chamber in Anne Arundel County that can offer 25% off the Better Business Bureau Accreditation fee. Additionally, NAACCC members can list their business on the BBB directory. Submit your listing here. Find how your business can take advantage of the NAACCC partnership with the BBB more by calling Shan Cephas at 443-963-2469.